For a moment, think about how much time you, your family, your kids, and your dogs spend inside your car. Think about the times you or your kids had spilled fast food in the back seat. Think about how your pets may have had accidents back there. Cleaning it up yourself will only help superficially, and vague smells will linger and accumulate. If you are a smoker, lighting up inside will only exacerbate your situation. The constant flow of everyday exposures inevitably leads to germs, bacteria, and odors being spread around the seats of your car. Even public toilet seats are cleaned more often than the average car, meaning you are allowing disgusting bugs just stewing inside. Allowing such filth for so long will lead you to turn to a professional cleaning service to give you peace of mind. Store bought odor removing products will only cover up smells on a temporary basis. Our car odor cleaning services use the latest in hospital grade cleaning products to remove the smell from its source. Bacteria, germs, and allergens will also be wiped clean in the process. The Pureteq cleaning system had been scientifically designed to kill bacteria and germs in an efficient and safe manner. The products will vaporize pet smells, tobacco residue, and other sources of odor into harmless gaseous molecules. Their coating product will also prevent the growth of additional mold, algae, and bacteria. Car odor removal services only have one job, and that is to remove the stench from your car. Within a four-step process, our usage of Purteq products will sanitize your car so that you will never have any recollection of past incidents. The team will begin by detailing your car just like any other cleaning service. We will then apply Pureteq’s proprietary SMOK and SHOK cleaning system. In an unusual fashion, fog machines will be run twice through your car using aforementioned products to intensely sanitize the interior. After wiping down with water, Prevent will be applied so that a 6-month barrier of protection will be applied to assure that you won’t have to return to our shop for awhile. Perhaps you may think that this process is overkill. In reality, neglecting the hygiene of your car will only reduce the value and resealability. Giving your used car that new car smell may add over $1,000 to the value. Such a small investment in car odor removal services is well worth it for such a large gain. 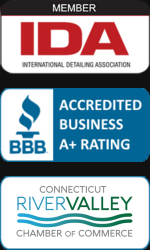 Do the smart thing and allow one of the most trusted professionals in Connecticut to resolve your interior odor issues. It will increase the quality of your family’s life and protect the value of your vehicle.